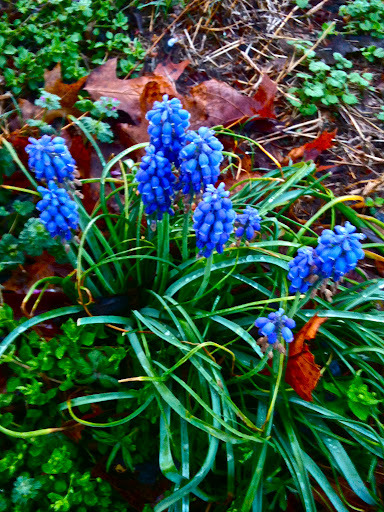 Thank heaven for spring, and it’s wonder of blooming colors and changing nature. This past Saturday, as I lay on my couch enjoying some March Madness, with my window wide open, it seemed that I could see the world getting greener by the hour. We’ve had two solid days of rain this week, which has only made me congratulate myself more on mowing my lawn on Sunday. And I’ve had three solid days of controlled chaos at work. You know how it is; half the office goes AWOL on spring break and the marketing team remains behind doggedly selling the shows and wading through all the crap that must go on even when (what feels like) everyone else is off the grid. I was down when I got home today. Grumpy and unhappy. And then, I looked up and realized that the sun was out. It was magic hour, and wouldn’t you know it, I had a sweet, loving dog at my side just begging to be taken on a walk. So off we went. Thanks to the marvel of modern camera phones, these aren’t half bad shots. But what I love the most about them is what they represent. I live in a subdivision. All of the houses look the same, and every time I take a walk through the ‘hood, I think of the Truman Show, except that our houses are not nearly as nice. No, these are houses that were built pretty quickly from a few generic ground plans. There’s not much character to them, at least from the outside. Long term residents try their best to supply some through their landscaping, or maybe a creatively colored garage door, but the truth is, I live in “Anysuburbia, America” at it’s blandest. But all three of the pretty little moments I captured in these photos were taken in my ‘hood. 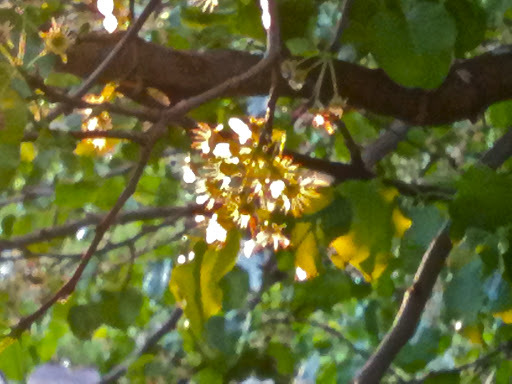 The glowing flower above is literally two houses west of me, part of a big flowering tree that hasn’t been trimmed in a while, and hangs onto the sidewalk. 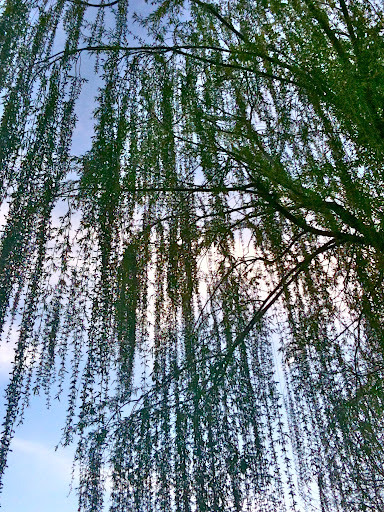 The blue flowers line a messy, unkempt lawn about 1/4 of a mile from my house; the willow tree, above, is the only one in the entire subdivision (how in the world did it get there?) and by the end of the spring, will hang so low that even my dog will have to duck under the branches to get through. Four houses down is a beautiful cherry tree planted by a friend’s grandfather at least 10 years ago; it’s huge and lovely and makes me smile every time I walk by it. So, as schmaltzy as it seems, I take a lot of comfort in these little moments of pretty. In this world where mediocrity is nearly a four-letter word, it helps to stop and literally smell the roses, or snap a photo of something beautiful. Often I begin my day by reading the opinion page in the newspaper (talk about depressing) and spend a good portion of the rest of the day dealing with unhappy people. I wish I could give them all a bit of the happy I get from my mini-photo-safari adventures through my bland little subdivision. We’d all end the day in a much better collective mood.